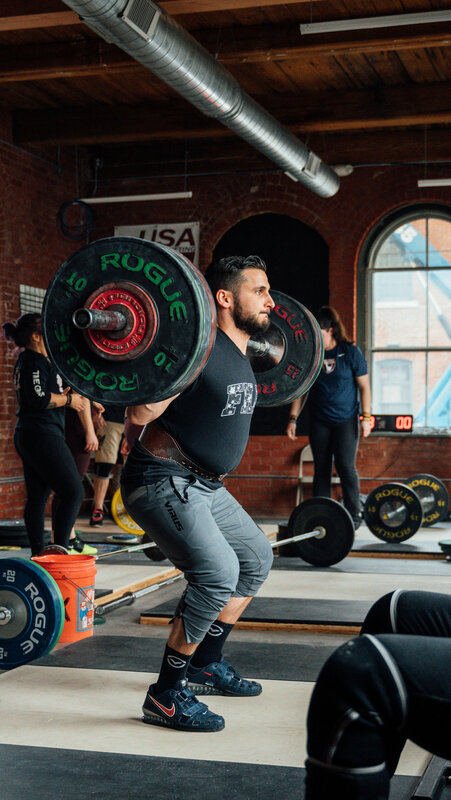 The Providence Barbell Club is a multipurpose training facility devoted to the sport of Olympic-style Weightlifting and Strength & Conditioning sports performance programs for athletes. We offer instruction, coaching, equipment, and programming for individuals at the beginning of their athletic journey to those on the national and Division 1 level. Feel free to stop by or contact us with any questions you may have. Listed are the general approaches to membership we have at the PBC. However, our goal is to help you develop as a weightlifter, so we endeavor to be as accommodating as possible to your schedule and needs. If you have any questions, feel free to contact us. Monthly membership is the core of the Providence Barbell Club. Regardless of experience level, members on the monthly plan can expect to have original, 4 day-per-week programming that follows a traditional, periodized approach. Concurrent with programming, members train under coach supervision during coached hours. Whether you’re visiting from out of town with your own programming or are a local who needs more help with the lifts, we welcome you. Programming for Olympic Weightlifting has become ubiquitous, and countless garden variety programs can be found online. These programs will vary in price, effectiveness, and experience of the author. There is nothing wrong with using an online program, especially for new and developing athletes. In fact, many suggest that a program is only as good as your belief in it. We agree. If you’re devoted to the program, you will see results; if not, you’ll collect evidence as to why it’s not the best program for you.